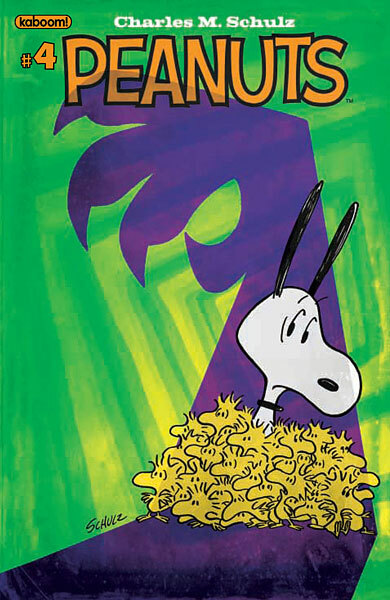 Peanuts Volume 2, Number 4 is in stores as of Wednesday, November 29, 2012. This installment of Boom! Studio's Peanuts comic book features the all-new stories "Food for Fraught," "How to Draw Violet," and "Do the Math," together with a few classic Peanuts Sunday strips and the "From the Drawing Board" feature. You can purchase this issue at your local comic book store or order it directly from Boom! Studios, and view a preview at Comic Book Resources. After this issue, the Peanuts comic book will once again be taking a few months of vacation before returning early in 2013 - so don't worry when you can't find a new issue next month!